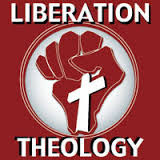 Liberation theology, is a political movement in Catholic theology which interprets the teachings of Jesus Christ in relation to a liberation from unjust economic, political, or social conditions. It has been described by proponents as “an interpretation of Christian faith through the poor’s suffering, their struggle and hope, and a critique of society and the Catholic faith and Christianity through the eyes of the poor”, and by detractors as Christianized Marxism. Liberation theology proposes to fight poverty by addressing its supposed source: sin. In so doing, it explores the relationship betweenChristian theology — especially Roman Catholic theology — and political activism, especially in relation to social justice, poverty, and human rights. The principal methodological innovation is seeing theology from the perspective of the poor and the oppressed. For example Jon Sobrino, S.J., argues that the poor are a privileged channel of God’s grace. Some liberation theologians base their social action upon the Bible scriptures describing the mission of Jesus Christ, as bringing a sword (social unrest), e.g. Isaiah 61:1, Matthew 10:34, Luke 22:35–38 — and not as bringing peace (social order). This Biblical interpretation is a call to action against poverty, and the sin engendering it, to effect Jesus Christ’s mission of justice in this world. THE LIBERATION THEOLOGY DERIVED FROM THE TEACHING OF JESUS CHRIST, JESUS CHRIST LIBERATES US IN SOURCE OF SIN FIRST IN YOUR MIND THINKING, OUR MIND THINKS BAD IS THE PRIME SOURCE OF SINS THAT YOU HAVE TO RID OR AVOID THINKING BAD TO BE FREE FROM SINS AND BECOME THE SOURCE OF SIN ON BAD WHAT YOU DO?…….MEANING THINK GOOD AND GODLY OR IN JESUS CHRIST TEACHING…. JESUS THINKING AND TEACHING IS VERY INTELLECT AND RATIONAL AND LOGICAL AND JUST AND FAIR IN PRACTICAL APPLICATIONS…GOD GAVE HIM THE BEST RATIONAL AND GOOD TEACHNG TO TEACH US IN GOOD AND SPIRITIUAL GOODNESS AND RATIONALITY AND LOGIC OR INTELLECTUALITY……SIMPLY THE PARABLES ARE VERY HARD TO THINK BUT THE WORD OF GOD IS POWER AND BLESSING BECAUSE EVEN YOU ARE VERY INTELLECT IN MANY THINGS IF GOD DOESNT WANT YOU TO UNDERSTAND HIS PARABLES OR CHOOSED YOU TO BE SAVED YOU WILL NOT UNDERSTAND HIM……. BUT JESUS ALSO WAS THE ONE OPPRESSED BY THE GOVERNMENT AND THE ABUSIVE PEOPLE OR HIGHER PRIEST DURING HIS TIME…...AND HE COMMAND HIS APOSTLES TO ARMED THEM IN SWORD TO PROTECT THEMSELVES BUT WHEN THEY PROTECT THEMSELVES AND ST. PETER HACKED IN SWORD THE SOLDIER PROTECTING THEMSELVES DURING THE ABDUCTIONS AND JESUS STOP HIM AND SAY LET THE MISSION BE FULFILLED OR TO SUFFER HIS OPPRESSIONS… THIS SCENARIO THE BELIEVERS BELIEVES THAT EVEN YOU PROTECT IN ARMED YOU ARE GODLY IN LIBERATING IN OPPRESSIONS FROM GOVERNMENT OR SIMPLY “SELF DEFENSE”……. THE GOVERNMENT WHO WILL PROTECT YOU FROM OPPRESSION IS THE ONE OPPRESSING AND ABUSING YOU AND PUTTING YOU IN POVERTY AND THEY MUST BE CHANGED DURING OUR TIMES EVEN ON BASIS OF JESUS CHRIST TEACHING BUT DURING JESUS CHRIST TIME HE MUST SUFFER THE OPPRESSION AND HIS TIME OF KINGSHIP WITH GOD WILL RULE AFTER JUDGEMENT DAY, HE MUST SAVE FIRST THE SINNERS AND BE OPPRESSED. JESUS CHRIST IS NOT A STUPID WILL FIGHT GOVERNMENT IN HIS TIME IN MINIMAL POWER AND RULE FOR HIS KINGDOM IT IS NOT HIS TIME YET. HIS MISSION IS TO SAVE MANKIND IN CRUCIFIXION AND LET ALL SEE THE RESURRECTIONS MIRACLES AND HE WILL COME BACK AND SAVE US IN GREAT POWER IN JUDGEMENT DAY AGAINST ALL THE GOVERNMENT AND KINGDOMS AGAINST GOD……. HE TAUGHT US TO FACE HARD AND POOR LIFE AND OPPRESSIONS, BE SIMPLE AND HUMBLE, GET YOU CROSS IN POOR LIFE OR HARD TIME IN LIFE, UNTIL JUDGEMENTS DAY AND REIGNING OF GOD AND JESUS CHRIST KINGSHIP….BUT IN THE PROCESS AS I HAVE SAID THERE IS GOVERNMENT TO PROTECT US IN OPPRESSION AND EQUALIZED US IN ECONOMIC LIFE AND JUSTICE ETC., ETC., BUT THE FACT TODAY EVEN IN JESUS CHRIST TIME, THE GOVERNMENT IS THE ONE ABUSING AND OPPRESSING US…IN OUR TIMES IN JESUS CHRIST TEACHING WE CAN CHANGED THE OPPRESSION OF GOVERNMENT HOLDING ARMS IN ACTIONS AGAINST OPPRESSORS GOVERNMENT BUT JESUS CHRIST WILL CHANGED THIS WORLD OPPRESSION IN THE JUDGEMENT DAY ON THE SECOND COMING……. IN PRESENT LEGAL SYSTEM IT IS REBELLION TO AGAINST GOVERNMENT BUT REBELLION IS AN ACTIONS OF SUPPRESSING OPPRESSION OF GOVERNMENT WHO ARE SOURCES OF SINS IN LIBERATION’S THEOLOGY AS JUSTIFIED… MEANING IN LEGAL SYSTEM THE GOVERNMENT LIKE IN MARCOS REGIME IS FULL OF VIOLATIONS OF LAW AND ABUSES, HUMAN RIGHTS ABUSES TO PEOPLE AND HE MUST BE OUST IN THE SEAT AND MUST BE PUNISHED, THE VOICE OF THE DEMOCRACY AND PEOPLE MUST BE CARRIED AND THIS IS LIBERATIONS THEOLOGY AND THE FILIPINO ARE LUCKY THE ARMED SUPPRESSION ARE NOT HAPPENED IN EDSA REVOLUTIONS. EVEN THE FILIPINO HOLD ARMED DURING THAT TIME THE PEOPLE ARE VERY GODLY LIBERATING PHILIPPINES IN OPPRESSIONS AND ABUSES…. DO YOU THINK YOUR GODLY OF SINNER IN EDSA REVOLUTIONS EVEN YOU HOLD GUNS OR ARMS DURING THAT TIME OR REVOLTING TO GOVERNMENT? WHAT IS IN YOUR MIND TO WHOM GOVERNMENT OR GROUP USED BY EVILNESS WE WILL LIBERATE THE WORLD FROM EVILNESS OF OPPRESSION AND POVERTY AND INEQUALITY IN POLITICS AND ECONOMICS AND SOCIAL AND CIVIL AND JUSTICE….. SINO ANG GINAGAMIT NG DEMONYO NA GOBYERNO O GRUPO ANG NAGLULUGMOK SA MUNDO SA KAHIRAPAN AT NANGAAPI O NAGOOPRES NA DAPAT NATING ILIBERATE O PALAYAIN ANG ANG MUNDO SA KADEMONYUHAN AT PAGHHIHIRAP AT OPRESYON….AT SA PILIPINAS SINO ANG NAGPAPAHIRAP SA PILIPINAS AT NANGAAPI UPANG ATING PALAYAIN ANG PILIPINAS SA GANITONG KALAGAYAN……. I THINK, THINK GOOD IN PROMOTION AND EMPOWERMENT OF HUMAN RIGHTS AND GOOD GOVERNANCE IS BETTER TODAY FROM PHILIPPINES TO THE WHOLE WORLD IN GOOD HIGHER THINKING IN GOOD DEEDS UP TO JUDGMENT DAY…. “ANG TANONG MALIGTAS KA KAYA? O MAKAKAISA KA SA PAGHAHARI NG DIYOS AT NI KRISTO SA BAGONG JERUSALEM” AT MALILIGTAS KA KAYA KUNG ISASAPRAKTIKA MO ANG LIBERATION THEOLOGY” YUNG NAG-REVOLUTION SA EDSA SA TINGIN NYO MALILIGTS KAYA KAYO…..
ANG SIMBAHAN NG DIYOS O NI KRISTO NA KANYANG TINUBOS NG DUGO AY PARA SA LAHAT AT LAHAT NG SUMUSUNOD SA KANYA AT WALANG ITINATANGI ANG DIYOS SABI NYA AT ITO AY TINATAWAG NA CHURCH OF THE POOR NG LIBERATION THEOLOGIANS…. ANG SIMBAHAN NG DIYOS O PANGINOONG HESUS KRISTO AY HINDI PANGMAHIRAP LANG O PANGMAYAMAN IN CLASSES OF PEOPLE ITO AY PARA SA LAHAT AT HINDI NANGANGAHULUGAN NA ANG SIMBAHAN NI KRISTO AY KINAKAILANGAN NA MAGHIRAP KA MUNA BAGO KA MAGING MIYEMBRO NG CHRISTIANISM AT MAY KANYA KANYANG GAMPANIN ANG BAWAT TAO SA SIMBAHAN NI KRISTO. ANG LAHAT AY KANYANG NILIGTAS SA PAGKAKAPAKO SA KRUS AT ANG KANYANG NAPILI AY KANYANG PINALAKAYA AT PINAGKAKAISA AT PINAPASUNOD SA KANYA SA KANYANG SIMBAHAN. ANG BUONG SULOK NG MUNDO AY PINAGKAKAISA AT PINAABOT NYA ANG KANYANG ARAL UPANG MALIGTAS AT MAKAISA SA PAGHAHARI NG DIYOS… BINIGYANG DIIN NG PANGINOONG HESUS KRISTO ANG KAHIRAPAN AT OPRESYON AT HUSTISYA SAPAGKAT MARAMI ANG NALULUGMOK SA KAHIRAPAN AT NAGDUDULOT ITO NG PAGKAKASALA HINDI LANG KAHIRAPAN KUNDI LALO BINIGYAN DIIN NYA ANG KAYAMANAN O MAYAYAMAN NA SANHI NG KASALANAN AT PAGBIBIGAY NG HUSTISYA SA NAAPI O LAHAT SA DARATING NA PAGHUHUKOM…… DAPAT MAGBATA ANG TAO AT PASANIN ANG KANYANG PAGHIHIRAP SA BUHAY AT PAMUMUHAY AT YAKAPIN AT PANATILIHIN ANG PANANAMPALATAYA O KABUTIHAN SA DIYOS MULA KAY KRISTO AT BINIBIGYAN NYA NG PAGASA LALO ANG MAHIHIRAP SA KANYANG DARATING NA PAGHAHARI SILAY MGA API HINDI KAGAYA NG MAYAYAMAN NA NAMUMUHAY NG MARANGYA PERO HINDI NANGANGAHULUGAN AY HINDI MALILIGTAS ANG MAYAMAN MARAMING ARAL AT PARABLES DIYAN SI KRISTO KUNG MAGBABAGO KA AY MALILIGTAS KA MEANING YUNG MAYAYAMAN AY KUNG SUSURIIN MO ANG BIBLE AY TALAGANG BIHIRA ANG GAGAWA NG MABUTE AT ANG MAHILIG SA KAYAMANAN AY HINDI MALILIGTAS SUBALIT SI HARING DAVID AY BANAL SIYA AY HARI AT MAYAMAN AT AKING PALAGING SINASABI NA TINUTURUAN TAYO NG DIYOS AT NI KRISTO KUNG PAANO HARAPIN ANG KAHIRAPAN, MAGBATA TAYO SA KAHIRAPAN UPANG HINDI TAYO MAGKASALA NGUNIT HINDI NANGANGAHULUGAN NITO AY HINDI INAADDRESS NI KRISTO ANG KAHIRAPAN O NIRERESOLBA MEANING HINDI USAPIN ITO NG TRABAHO LANG SAPAGKAT MAY GOBYERNO NA NUNG PANAHON NUON NA SIYANG MAGBIBIGAY NG WASTONG PAMUMUHAY O KAAGAPAY SA BUHAY GAYA NGAYON. ANG GOBYERNO ANG SIYANG INSTRUMENTO NG ATING DIYOS UPANG SIYANG MAGING TIGAPAHAMALA NG SUBDUING NG EARTH AT TAO… KUNG MAGKAKAROON NG MABUTING GOBYERNO AY MAGKAKAROON NG EQUALITY IN POLITICS AND ECONOMIC LIFE ANG TAO SIMPLE AS THAT LALO KUNG MAY PULITIKA KANG MAGANDA KAGAYA NG SOSYALISMO… KUNG MAALALA NYO ANG RUSSIA NUNG MAGING SOSYALISMO SILA PINAPAGCONVERT SILA IN CHRISTIANISM NI MOTHER MARY SA MIRACLES NIYA SA FATIMA YUN NA LANG ANG KULANG SA BANSA NILA FOR GOOD AND GODLY LIFE….